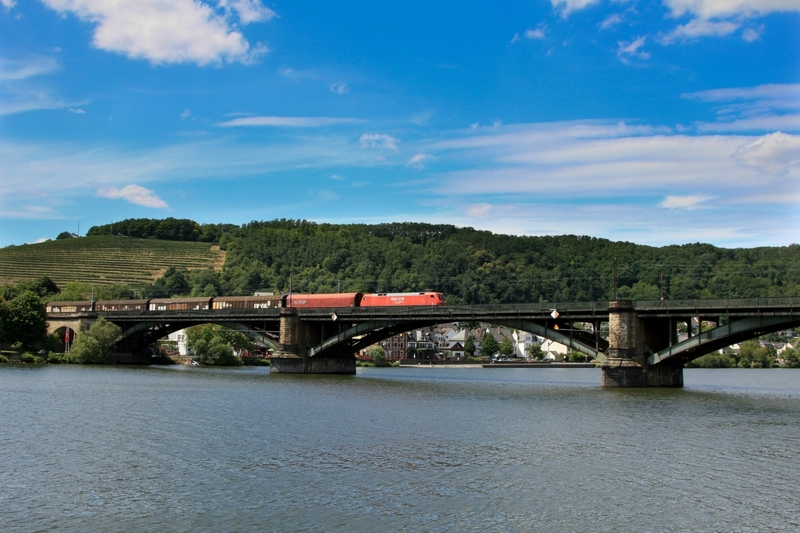 The railway line between Koblenz and trier is in the German region of Rhineland Palatinate. The line begins in Koblenz Hauptbahnhof station, and splits from the "Left Rhine line" across the Moselle railway bridge near Güls (photo below). For about 50 Km the line runs on the left side of the Moselle between vineyards and the River to the town of Cochem. After Cochem enters the tunnel Kaiser Wilhelm 4205 meters long. This was the longest railway tunnel in Germany since 1877, the year of its construction until the opening of the Landrücken tunnel in 1985. Upon exiting the tunnel, the line crosses the Mosel near Eller on a metal bridge 281 metres long (photo at right), a short tunnel and then you get to Bullay where you cross the Moselle river rushing over a magnificent two-storey bridge. The upper floor of the bridge is crossed by the railroad tracks and the lower floor is crossed by the road . It is built as a steel truss with six spans with a maximum 72 light meters for a total of 314 meters long. (photo at left). Immediately after the bridge Alf-Bullay the line passes through a tunnel of 458 meters,after that there is the Hangviadukt viaduct built on the edge of a hill full of vineyards for a total length of 786 metres. The viaduct has 92 spans, each with an internal diameter of 7 m (photoat right). At the exit there the junction to Traben-Trarbach (photo at left) after which the railway leaves the Moselle valley through another tunnel and continues until Trier totalling 113 km. 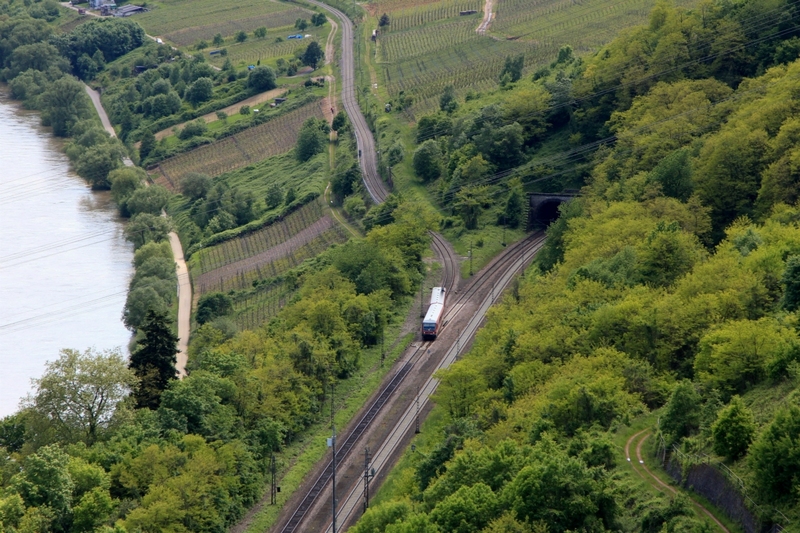 The line, despite its military origin, has achieved over the years a great economic importance in the region, including neighboring France and Luxembourg. It is used by freight trains, local trains but only two IC trains per day.